Thank you to everyone who took the time to comment on my last post. It really means a lot to me that you all are still here reading my blog, no matter how long the distance between the entries. All your responses really helped me to figure out what I want with this blog. It reminded me that most of the pressure I was dealing with behind the scenes was homemade with me going in circles thoughtwise. I think with your help I got rid of that pressure. Which means that I can finally go back to developing recipes and taking pictures! I hope you are all having a great summer! Ours was a bit too hot, in my opinion, especially since it never really seems to cool down in a city. So it’s nice when you know people who live at the edge of town, blessed with a huge garden and a lot of fresh air. Although I often love living in a very vibrant neighbourhood, surrounded by Gründerzeit houses, from time to time it’s also nice to sit around in someone’s garden watching the sunset. Although when you do this with a couple of your co-workers by your side and you also made a cake for this occasion, you’re usually very much distracted from sunset watching by recipe inquiries. And for about 10 minutes or so the table on which your cake is sitting, is also a bit more interesting than the sun. Then the cake is gone and for the rest of the evening you have to promise that you will hand over that recipe. Soon. And yes, you read that right. Ten minutes and the cake was gone. While competing against a boatload of tiramisu, which I imagine was very good, but unfortunately not vegan. 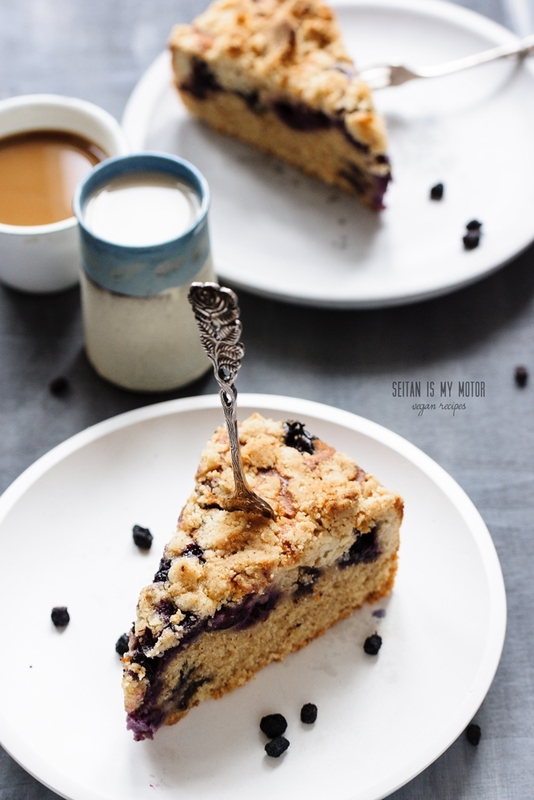 Thanks to my lovely coworkers, who always have the nicest compliments for my food and keep asking me for recipes, you can now try this blueberry crumb cake yourself. Plus, if you followed the news this week, be it over the pond or here in Europe, you all probably need a little something to cheer yourself up. 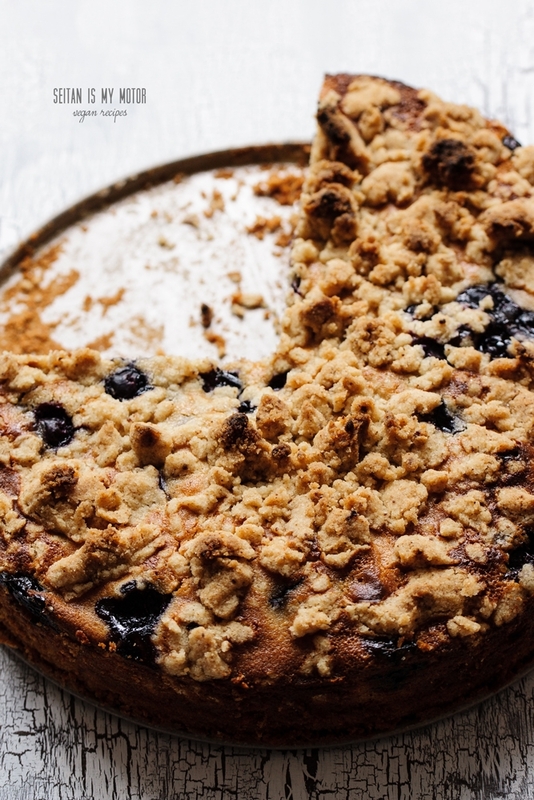 This mixture of crumb cake and cheesecake got a lot of praise from everyone who tasted it. Preheat oven to 200°C and grease a 26 cm springform pan. To make the cake, combine flours, baking powder, sugars, salt, and vanilla in a large bowl. Whisk in milk and oil. Pour into the pan and bake for 10 minutes. In the meantime prepare the filling and the crumbs. For the filling combine all ingredients (except for the blueberries) in a blender and mix until smooth. For the crumb topping mix all ingredients and knead until soft and large crumbs form. Remove cake from oven and spread filling on top. 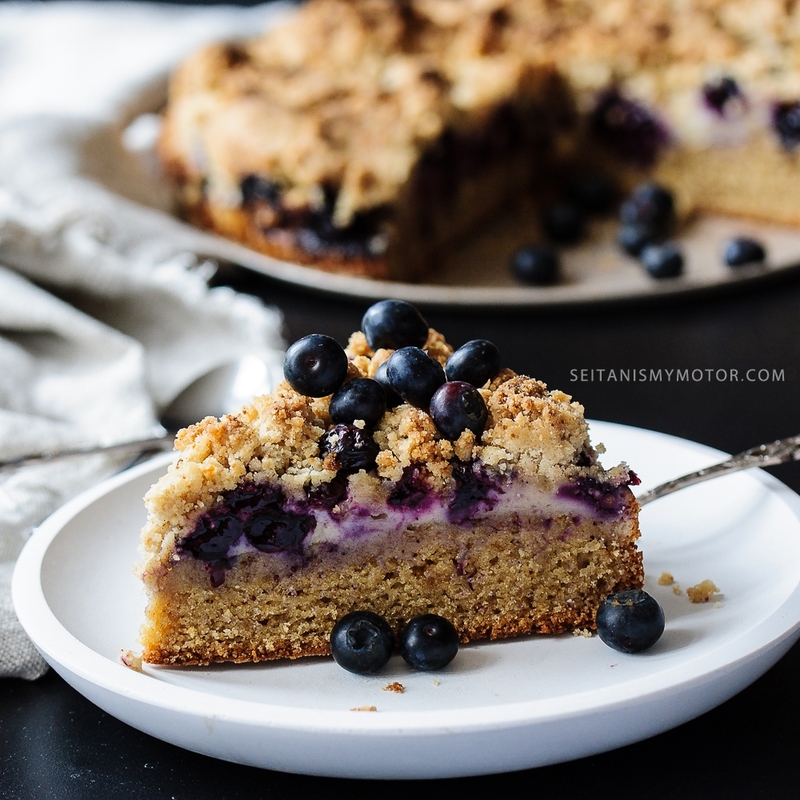 Evenly distribute the blueberries on the filling. Bake for another 40 minutes or until the crumbs are golden brown. Let cool on a rack for about 15 minutes before removing the cake to cool completely. Den Kuchen gab es für uns heute zum Frühstück, ich habe überall die Zuckermenge um die Hälfte reduziert, für uns reichte das so. Alles andere habe ich so gelassen und er war soo lecker! Vielen Dank für das wunderbare vegane Rezept! Bitte weiter so, dein Blog ist toll. So jetzt musste ich den Kuchen aber dringend nachbacken-ist mir die ganze Zeit im Kopf rumgeschwirrt. Hatte heute wunderbare Waldheidelbeeren auf dem Markt entdeckt die ich etwas gezuckert habe und es wurde wunderbar! Habe lediglich Rohrzucker anstatt normalem und dafür keinen braunen Zucker genommen weil ich nur den hatte. Würde behaupten hat nicht geschadet! Denke den wird es mit variierendem Obst noch öfter geben. Danke vielmals für das Rezept! Hallo Carina, das freut mich sehr! Der Rohrzucker dürfte keinen Unterschied machen. Und das mit dem variierenden Obst klappt auch sehr gut, z. B. Äpfeln. Oh ja dein Blog und du bist sehr beliebt, bitte bitte bleib dabei, egal wann ein neuer Blogeintrag kommt Hauptsache du machst weiter, bitte bitte! Hi I would hate to pressure you to keep blogging, but please keep blogging if you can. This page has by far the best vegan recipes I’ve ever found and I’m always happy when new recipes appear even if I have to wait 6 months! Thanks for all the deliciousness! No pressure felt at all, Gill! Thank you so much for your nice words. Oh ich freue mich sehr wenn du den Blog weiter liest, da ich deine Rezepte gerade so gerne mG weil sie so ‘normal’ sind. Ich hoffe du fasst das richtig auf. Deine Rezepte kommen nicht übertreiben gesund daher und schmecken wirklich gut. Gerade das finde ich so wichtig wenn ich irgendwo einen Kuchen mitbringe und der sich zwischen den nicht veganen einreiht. Man hat eh so das Stigma vegan schmeckt nicht und da tut sich ein Bohnen-mit Dattel gesüßt Kuchen doch schwer. Vielen vielen Dank für deine tollen Rezepte! Hallo Carina, es ist auch genau mein Ziel, “normale” Rezepte zu machen, gerade weil ich meine Sachen auch überall hin mitnehme. Viele Leute bekommen so eine andere Meinung über Veganismus und fragen dann nach den Rezepten. Freut mich sehr, dass sie bei Dir auch so gut ankommen!